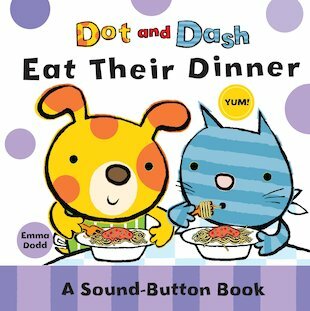 It’s dinnertime, and Dot and Dash are ready to eat – along with their friends Big, Tall and Small. But fussy Dash doesn’t want to eat the dinner. Yuck! Dash only wants to eat pink food today! Can clever Dot find Dash a healthy treat that he’ll love to eat? Little ones will love pressing the “yuck” and “yum” sound buttons in this comical board book, in which Dot and Dash discover that healthy eating can be fun.